The apple was discovered growing in a garden in Tilgate near Crawley and introduced into cultivation by local nurserymen J Cheal & Sons. It was awarded an RHS Award of Merit in 1912. 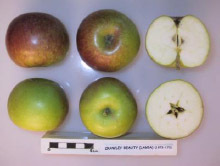 There is some confusion about its origin, as it is identical to the French variety Nouvelle France (National Apple Register 1971). It is currently cultivated as part of Brighton Permaculture Trust’s National Collection in Stanmer Park, Brighton. You can see a Crawley Beauty apple tree (planted 2009) in Home Farm Orchard, Stanmer Park ( map). The Crawley Beauty is a very useful cooking variety. The apple cooks to a lightly flavoured puree and can be eaten fresh after storing. Size medium. Shape flat-round to round: flat base. Basin broad quite deep, slightly puckered. Eye open; sepals separate at base; quite downy. Cavity medium width, depth; little russet. Stalk medium thick. The colour of the skin is greenish-yellow, flushed brownish-red and with broken red stripes. Fruit can be picked by mid October and stored until January. Crawley Beauty is a moderately vigorous, spreading tree which crops heavily. The Crawley Beauty can be grown in colder, frost-prone areas, because it flowers late and is disease resistant. The variety grows well on chalky soils. Flowering at the beginning of June, the Crawley Beauty variety is self-fertile.